With this latest spell of hot and steamy weather, my cucumber patch is exploding. Hundreds of bright yellow blossoms decorate the prickly, green vines. All sorts of pollinators buzz from early dawn until dusk, spreading the wealth that one day will become pickles. My husband likes to scour the cucumber plants early in the morning, just before the dew has dried. Following the advice of Brownie Schrumpf, (my “foodie hero”; a longtime Bangor food educator, food writer and college friend of my grandmother), we sort our cucumbers. The Suyo longs make the best Bread & Butter pickles, Double Yield is tasty as a dill spear, and the Wautomas are tasty in any pickling recipe. We don’t always want to wait a few weeks to enjoy the crisp bite of a perfect pickle with our sandwich, and that’s when I like to make Deb’s Favorite Refrigerator Pickles. 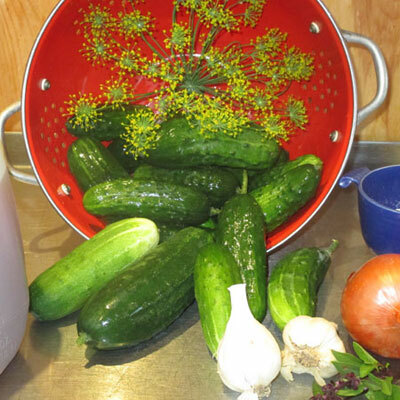 My friend Deb Suran grows vegetables in the same way I enjoy baking bread; plenty of extras for friends and family. She tells me that this brine will pickle any vegetable: onions, garlic, sweet and hot peppers, carrots, even cauliflower, which is “fantastic, add some diced green bell peppers for a little snap.” I like this recipe because it allows for plenty of creative license with what’s available in your garden or at the market. Purple basil blossoms, feathery cilantro blooms, bay leaves, even cinnamon sticks add a different dimension to the flavor. Just be sure to use a canning or pickling salt, one without additives and iodine, which will discolor your perfect pickle. And be sure to share, I’d love to try some! 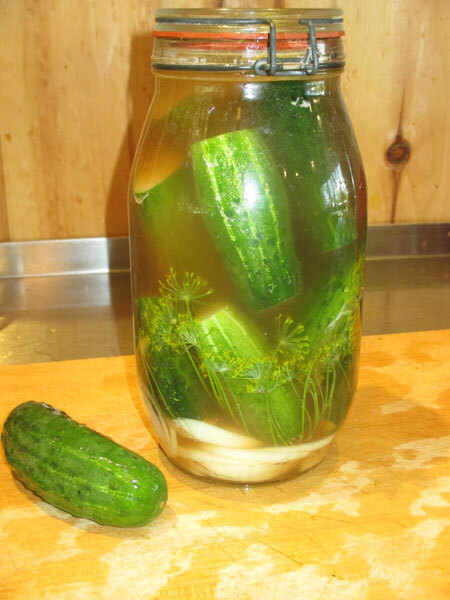 This brine will pickle any vegetable, including sweet and hot peppers, carrots, and cauliflower. These pickles will keep in cold storage for up to 14 months. Peel the garlic and onion. Using a sharp knife, cut into slices. Wash and scrub the cucumbers. Trim about ¼ inch from each end. 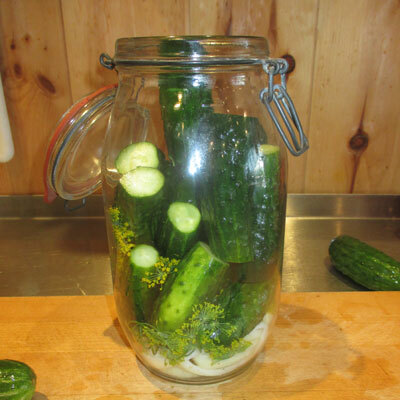 To prepare the pickle brine, combine the apple cider vinegar, water and pickling salt in a 1-quart jar. Shake well to combine. 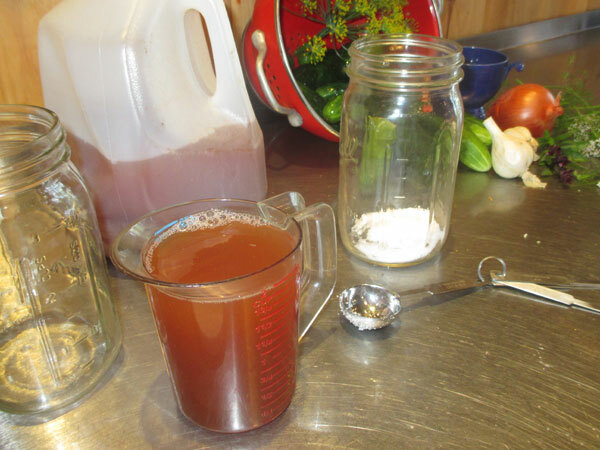 Layer the sliced onion and garlic in the bottom of a ½ gallon jar or 2 – 1 quart jars. 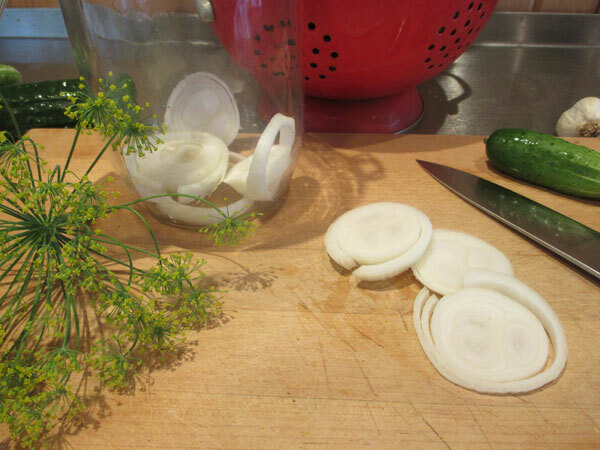 Add the dill blossom head or other herbs of your choice. Pack the scrubbed and trimmed cucumbers and hot pepper into the jar. Pour the brine over the top of the vegetables, being sure that the brine completely covers them. Allow the pickles to sit for 24 hours at room temperature, then eat or refrigerate. 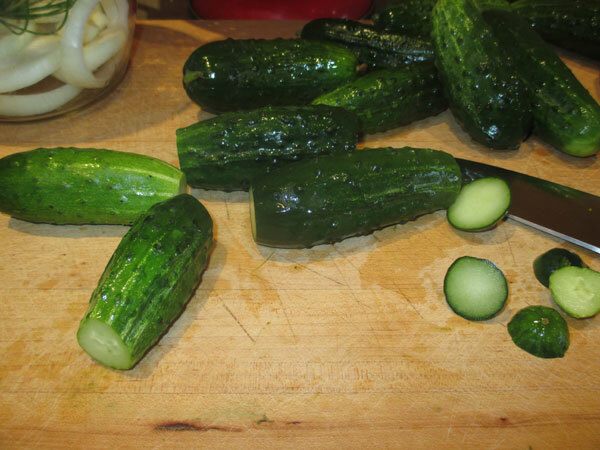 As you eat the cucumbers, you can also eat the onions, hot pepper and garlic. Nutritional analysis per 80 gram pickle (varies with size): 14 calories, 3 grams carbohydrates, 0 grams protein, 931 mg. sodium, 0 grams fat, 0 gams fiber.